While I love my little welcome sign and I usually try to embrace its message, there are some things that are completely unwelcome. . . . 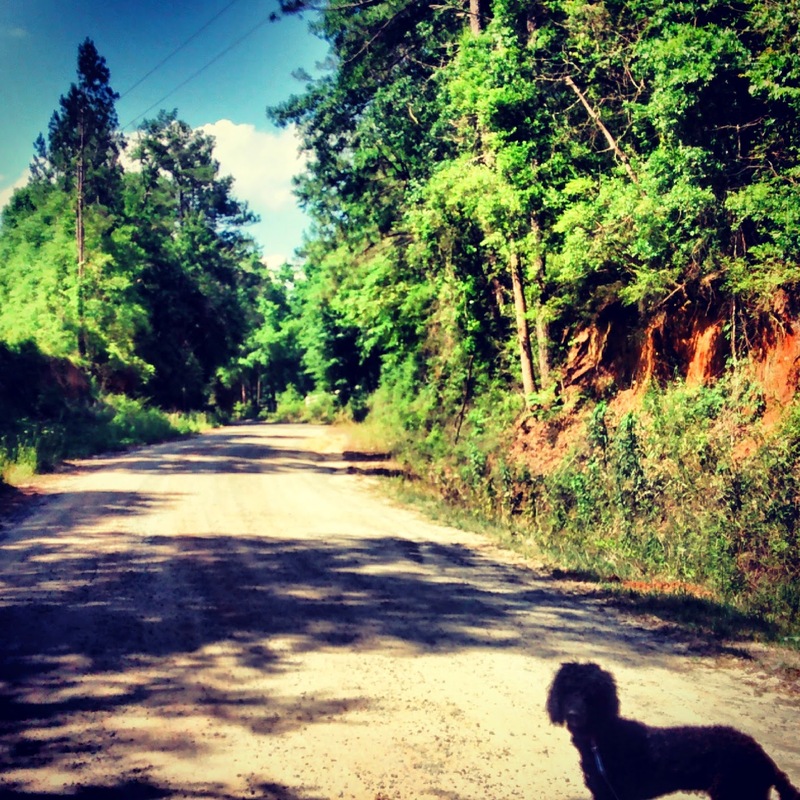 This weekend was very exciting (and not the good kind) on our little dirt road. It all started a little after four on Saturday morning. But before I continue on with that, let me set the scene for you a little bit. . . .
I’ve mentioned before that our little farm is situated between a busy paved highway and an unpaved county road with the house on top of a hill that stretches alongside the county road and the pond at the bottom of the hill near the highway. Me and Bryony during a walk on our little country road. Our farm is located on the right side of this picture. Once you make the turn onto our county road, we’re the very first house. Our neighborhood isn’t very big. . . it really only consists of ten or slightly more homes, a baptist church, a very old cemetery, and a lot of woods. Not exactly a lot going on. Until Saturday, that is. You see, a little after four o’clock that morning with the sun still firmly in bed, the dogs started barking. And barking. And barking. Which, honestly, it’s not completely unusual for them to be startled by a noise during the night and have to tell the whole world about it. But they wouldn’t stop. So, I looked out the front towards the pond and saw nothing. My mother looked out the back door, turned on the porch light, and saw nothing. And we both went back to bed. Fast forward a couple of hours. . . the sun is up and shining brightly, and my mother gets in the car that she drives for a quick trip to town when she notices a cigarette laying in front of the steering wheel. There’s more. As she pulls out of the driveway, she sees a pickup truck crashed in the ditch a few hundred feet down the road and one of our neighbors trying to figure out what on earth it was doing there. She finds out from him that his child’s four-wheeler is missing. The police are called, and what happened is sorted out. Apparently, someone stole the truck from a neighborhood just down the road. Then, they wrecked it on our road. They walked to our house (cue the barking dogs), tried to steal the car, and were scared off when my mother turned on the porch light leaving their lit cigarette behind. They ran past my quail and down the bank to the road. and you may notice the trail they left behind. The bank bordering our road, by the way, is steep. In fact, in the spot they went down it’s not far from being vertical. Back to the story. . . Then, they went to our neighbor’s home, stole their four-wheeler, and left. Here’s the odd part. They returned it. The four-wheeler, that is. In broad daylight. Just a few hours after they stole it. Two lessons I learned this weekend. . . Car doors should be locked, even if you live in the country. And my dogs are a whole lot smarter than I am. What a shame. I’m sorry that happened. We’ve had someone steal from us a couple of times, and it left an uneasy feeling that hasn’t been forgotten. We’ve made it well known now that this is the last place someone wants to rob because there are harsh consequences waiting.